Mark Golob thought that he could misuse the judicial system to chill free speech and purge the Internet of unflattering comments made about him by his former franchisees. 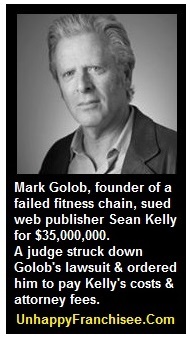 Mark Golob sued me for $35,000,000 in an effort to bully me into removing interviews and comments about him from UnhappyFranchisee.Com. However, Mark Golob’s plan backfired in a big way. A Superior Court judge struck down his lawsuit and ordered him to pay my attorney fees and costs. Instead of purging the Internet of criticism, Mark Golob has thrust himself and the story of his failed Butterfly Life franchise chain back in the media spotlight once again. In the wake of the success of the Curves for Women, Mark Golob founded Butterfly Life women’s fitness chain in 2003 and sold dozens of franchises at an investment of $87,000 to $250,000. By 2008, the chain was in decline, suffering widespread franchise closures and impending lawsuits from angry franchise owners. In both formal interviews and informal comments posted on my UnhappyFranchisee.Com blog, failed and failing Butterfly Life franchisees shared their experiences and described the financial and personal toll their franchise investments were taking. Many franchisees blamed CEO Mark Golob, alleging that he misrepresented the franchise opportunity and failed to provide promised marketing and advertising support. In 2011, Mr. Golob’s then-attorney Scott Hammel sent me a threatening letter objecting to some comments and demanding that I remove all references to his client from UnhappyFranchisee.Com. I refused, and provided him with an excerpt of Section 230 United States Code (47 USC § 230) that states that web publishers are not liable for the content of 3rd party comments. Read the initial summons here: Golob v. Kelly. After being served, I consulted with a number of prominent 1st Amendment attorneys and organizations. After much research, I hired Peter Lagarias, a highly respected California-based franchise attorney and former lead prosecutor for the Federal Trade Commission (FTC). Everyone I spoke to agreed with my assessment that my statements were not even remotely defamatory. That Mr. Golob has a “history of litigation” is a provable fact, and stating the truth is not defamation. That Mr. Golob has a “checkered past” is clearly my opinion, and stating an opinion does not constitute defamation. So why would Mark Golob and Nikolaus Reed launch such a high-dollar lawsuit based on comments that seemed mild, at best? In a March 10, 2014 conference call between myself, Lagarias, Golob, and Reed, the true intention of the lawsuit became clear. Golob was not concerned about the specific statements cited in the lawsuit. His objection to “history of litigation” and “checkered past” was just a pretense to hit me with a scary and costly lawsuit he believed would force me to remove all content that referenced him – including 3rd party comments and franchisee interviews. Mr. Golob stated he would do “whatever it takes” to force me to remove content “anywhere [his] name appears” on the site. …there has been a disturbing increase in lawsuits brought primarily to chill the valid exercise of the constitutional rights of freedom of speech… The Legislature finds and declares that it is in the public interest to encourage continued participation in matters of public significance, and that this participation should not be chilled through abuse of the judicial process. March 14, 2014 Peter Lagarias filed a Special Motion to Strike the Golob v. Kelly lawsuit. March 28, 2014 We received Golob & Reed’s Opposition to our Special Motion to Strike. April 2, 2014 We filed a Reply to their Opposition. April 11, 2014 Peter Lagarias argued for the Special Motion to Strike before Judge Richard J. Henderson in the California Superior Court in Mendocino County. Nikolaus Reed argued his case by phone. The court finds that the principal thrust or gravamen of Kelly’s website was to provide a forum for those interested in acquiring more information about specific franchises, primarily for the purpose of investment and operation. The site performed generally as a “consumer watchdog” where interested individuals could exchange ideas and experiences about particular franchises… Kelly’s challenged comments that Golob had a “checkered” past and “history of litigation in the health club industry” are sufficiently related to “consumer watchdog” purpose of the website. As discussed above, the court has found that defendant Sean Kelly made a prima facie showing by admissible evidence that the challenged statements set forth in defendant Sean Kelly’s unhappyfranchisee.com website were made in a “public forum in connection with an issue of public interest” (CCP 425.10 (e)) and that plaintiff Golob failed to establish a “probability” of prevailing on his claim by making a prima facie showing by admissible evidence that would, if proved, support a judgment in his favor. ( Kashian v Harriman (2002) 98 CA4th 982, 906) The motion of defendant Sean Kelly to strike the complaint of plaintiff Mark Golob pursuant to CCP 425.16 is granted. Defendant Kelly has prevailed on his motion and is entitled to the recovery of his attorney fees incurred in this motion. ( CCP 425.J 6(c),• Ketchum v Moses (2001) 24 C4th 1122, 1131.) Counsel for defendant Kelly is directed to serve and submit a formal order consistent with this ruling no later than June 16, 2014. Special thanks go out to attorney Peter Lagarias for his fierce and relentless advocacy not only for UnhappyFranchisee.Com, but for the rights of franchisees and former franchisees. I’d also like to thank Duffy Carolan of Duffy, Vick, Carolan, Ken White publisher of Popehat.com and attorney at Brown, White & Newhouse, attorney Paul Steinberg, and Don Sniegowski of BlueMauMau.org and many others who lended support and guidance. CONGRATULATIONS!!!!! It looks like you’ve been rather busy lately! :) We definitely need more people like you to fend off these ridiculously greedy folks out there who think they can just sue the pants of off everyone and they’ll get what they want. Thank you so much for all your efforts into helping us “little folks” who signed our lives away when we signed on to be a franchisee. It is the WORST experience in the world, feeling helpless, losing thousands, and finding no one in the right position to help us properly. You’ve heard from so many people that thank you so much for helping them to find a voice in this whole disasterous franchising experience. Now, as soon as JTH is locked away, I’ll be “over the moon” happy. What goes around comes around and revenge can be oh so sweet. :) Have a great day, Sean, and thanks again so much for doing what you do. Way to go Sean. You have become a target because your site has leveled the playing field more than any other resource available to potential franchisees. You have exposed numerous con men and thieves disguised as franchisors and saved potential victims millions of dollars. Legitimate franchisors should be singing your praises because millions of dollars lost to these guys could be spent in their systems. You are the true embodiment of a “consumer watchdog.” I am a big believer in Karma and believe that good things are headed your way. Chalk one up for the good guys. Thanks, Jon. And thanks for being there for me last year when David Rutkauskas took a run at me. Let’s hope the next guy will realize that joining the conversation will work out better. BRAVO!!!!! Thanks sooooo much Sean for making my day…and making all the trials and tribulations we had with Golob over the years well worth it!!!! My partner and I started the ball rolling nine years ago with a Class Action suit against Golob. If you could see the giant smile I have on my face you would know how elated I feel! Golob spent many years taking advantage of innocent people who wanted to better their lives and support their families. He tried to hit us with a SLAPP lawsuit years ago also…but the truth prevailed!!!! Thank you Sean for giving us the opportunity many years ago, with your website, to inform other Butterfly Life Franchisees across the Country of their rights and a platform for all of us to communicate. You’re a champion with amazing tenacity and we all thank you for being our voice through this exhausting experience. Also, please pass on our thanks to Peter Lagarias for being a great advocate for franchisees. We met him in San Diego at the AAFD Convention 2005…right before we decided to close our doors!!! I will be toasting you at dinner…..cheers!!! Thanks, Carol. You’re the best. I appreciate your refusal to be a victim and go away quietly. You lost more than I did on this, but never stopped sharing your story and warning others. Congratulations! I recently won one of these, too – convicted felon Keith Gilabert sued me for reporting on his fraudulent hedge fund. You might want to contact the Digital Media Law Project at Harvard (https://cyber.law.harvard.edu/research/dmlp) – they are looking for cases like these. Congratulations to you, Annie, and thanks for the link. Our freedom of speech and freedom of the press are two things that really set the U.S. apart and make me proud. But we have to keep fighting those who use the court system to coerce others to give up those rights. I look forward to reading about your win against Gilabert. Thanks for commenting! CONGRATS ON THE VICTORY IN THE LAWSUIT. I ALWAYS RESPECTED YOUR STRONG STANCE ON THESE UNSCRUPULOUS CHARACTERS PREYING ON FRANCHISEES TO ENHANCE THEIR WEALTH. WE NEED MORE PEOPLE LIKE YOU AND YOU’RE MY HERO. YOU SHOULD SUE THEM FOR DAMAGES. My blog was also sued for defamation, though the person who brought it (an outdoor writer for the SF Chronicle who should have known better) did so in small claims court, which made it impossible to bring an anti-SLAPP motion. Of course I won the case, but the real trial came after, when the plaintiff and a friend began harassing my family, ultimately descending into a string of threats (including a letter with more than a passing mention of a handgun). Using nuisance suits to silence wholly legal speech isn’t new, but given that blogs largely lack the backing of a legal staff, I’m sure their use is probably on the rise. Good on you for winning. Let’s hope the fight doesn’t continue for you too. I am happy the hear about the outcome. Any reasonable person would know Golob stood no chance, but this lawsuit clearly shows how out of mind these people can get- people who scam and misrepresent for their own personal gain and greed. It is unfortunate you had to go through this ordeal to prove that our constitutional rights are still upheld when challenged by crazy, greedy conmen. Congratulations on winning your lawsuit and preserving free speech. I know we have had our differences and I have questioned your loyalty to the cause but it feels my heart with joy that you have prevailed in this manner against Mr. Golob. It restores a little faith in our system knowing others can use your website not only to vent frustration but gather facts and educate those who might wish to purchase a franchise from a franchisor. God Bless You! and your family on this Christmas day 2015.